By the mid 1980s many of the early pioneers of the SSF had run their course. They had been at the helm several years, overachieved what they had orginally set out to do leaving Scotland punching well above its weight amongst European surf communities. Gradually family, personal and business reasons grew in priority and as such many decided to take a back seat from the SSF ship wheel. A number of younger people put themselves up for important tasks in the Federation after that and much of the accent shifted from the South East to the North East. David Long from Kirkintilloch was the exception, acting as President into the early 1990s. Iain Masson valiantly took on the job of running the British Championships in Fraserburgh in 1992. Sponsors were found for the event and though the surf wasn’t great, the event was successfully run. 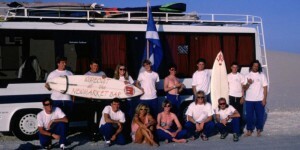 Scotland took on the job of running Eurosurf in 1993. A key player was Gordon Wheeler, who worked tirelessly during the event to make it work. A Managing Committee was formed and a company set up to run the event. Conditions for the event were atrocious, the car park became a mudbath and the surf was generally messy and poor quality. By the end of the contest, most of the teams couldn’t get out of Thurso quick enough. Communication began to break down (during the 1980s there was regular newsletters) and the Federation income declined. Many of the broader activities that the Federation had been involved with gradually eroded throughout the late 1980s and 1990s which in turn reduced membership interest. 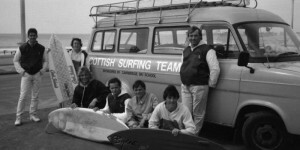 By the late 1990s, the last of the older experienced individuals had run their course and the management of the Federation moved towards a few enthusiastic younger surfing individuals. As the SSF had expanded over the years it developed financial commitments. Financing surf teams to compete at British and international competitions took a significant load on the SSFs finances, this resulted in the same ‘elite’ benefiting from the SSF but the broader surfing population having little in return.